Indian Vanity Case: Mac Products- The Good, The Bad & The "Ugh!" Mac Products- The Good, The Bad & The "Ugh!" But I hope others will find it kinda helpful too. **Shade names are not recommendations btw. Pick shades that suit you. 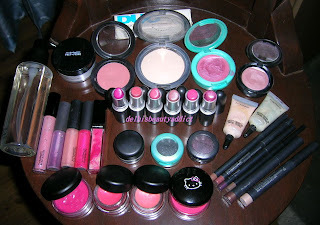 And please note that I haven't used all of Mac's products, so I've just listed the ones I've actually used. Select Cover concealer- Peach and green (mine are so old now.) I like the non-cakey coverage. Shadestick- Beige-ing looks great on the waterline on those days when white liner just doesn't cut it. Brushes: If you don't mind paying around Rs.1000 for a make-up brush, then Mac has the best. I have never bought any brushes from Mac, because I think they're too pricey. But I might buy a stippling brush one day. Studio Sculp Concealer- Way to cakey. Reveals more than conceals, in my opinion. Clear lipglass- Sticky sticky sticky on lips. I even tried using it on my lids and I couldn't blink! Pro longwear lip clour- Drying and cracks...and then flakes. Zoom Lash Mascara - Blah! Pigments- I have Naked, Fairylite, Black tied and Steel Blue (which I like but hardly use) Previous 3 can't be used on either lip or eye area, so what's the point!!! Phew! Okay, that's all I guess. I hope I didn't forget anything. em lookin forward to get shadesticks !! btw what do you think of clarins instant smooth perfecting primer !? is it good at controlling oil ? or does make up really last longer ?? cz I have heard its great at minimizing appearance of pores and wrinkles .. so I wondered if its any good for oily skinned ladies like me ? will love to hear from yu ! hahah! the part where u couldn't blink when you applied the clear lipglass is sooo funny! i agree that some items from MAC are just a waste of $$. I used to be crazy over MAC. But after trying out Japanese brands, I totally stopped investing in MAC. Except their brushes! I have the strippling brush!! And its the best brush for blush application in my opinion :) thanks for the great post Cynthia!! @ C Beautiful...thanks i'm glad u find it helpful. @ Pchan...haha...it was so sticky i had to use my finger to pull my lid down :D. I know what u mean! Even I'm liking Jap n Korean brands more these days. Mac is beginning to get kinda bland for my taste. But ya the stippling brush does look great. @ Palak..always happy to help girly. About the Clarins primer, yes it does minimize pores makin the skin smoother n also minimizes appearance of fine lines. From the first moment I tested it i had to have it coz it feels so silky! But sometimes it does get a tad oily after a while esp around my t-zone in summer, altho this happens even without it. I've read som pple say it clogs pores n cause breakouts, but it's not happened to me. So it's totally up to u to decide whether u wanna try it or not. 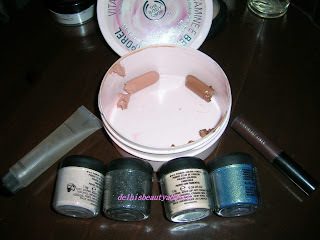 Fyi, that little pot will last a long long time coz u jus need v little for each use. As for it making make-up last longer, I really can't say coz i don't even think about that in the first place. I just like the smoothness n Eyeshadow application goes on smoother with this as a base. I love your collection !!!! So pinkish !! regarding the cream shadow issue, yup... almost every cream shadow products i've used on me creases... one of the fellow blogger suggest to use a primer though... despite the fact that i'm such a lazy person, i might use a primer for the sake of those cream eyeshadows since they are really just too pretty!!! Hi Cynthia, thanks for your comment. My CS 88 piece pallete is a mix of matte and shimmer. I don't have any of the other 88 palletes, but I love that I have so much choice in color and texture with this one. Hope that helps ya! ok , then maybe I wont give in for clarins cz basically I wanted something that'll control my oils and adhere foundation to mah skin better ! btw cynthia .. have u heard of Monistat ?? well . em sure yu did .. buh can yu tell me if somethin similar to it is available in India ?? Sonali I'm glad u think that.